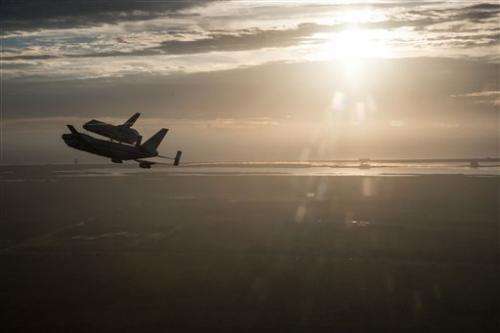 What's it like to fly a plane with shuttle on top? 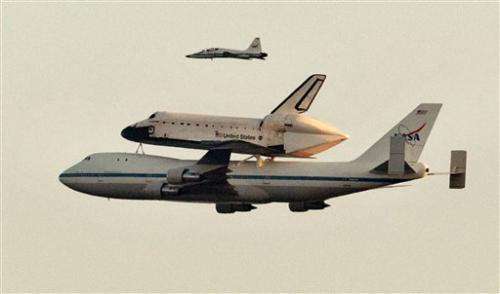 (AP)—It's the ultimate piggyback ride: A space shuttle perched atop a Boeing 747 as the pair crisscrosses the country. For three decades, this was how NASA transported shuttles that landed in the California desert to their Florida home base. But it's coming to an end. This week, four pilots took turns flying a jumbo jet mounted with space shuttle Endeavour on a multi-leg journey bound for Los Angeles where it will go on display in a museum next month. With the shuttle fleet retired, it's the final ferry mission for a group of highly specialized aviators. The elite pilots over the years have included former astronauts, including famed pilot Gordon Fullerton. Scores have asked what it's like to haul a 170,000-pound (77,111-kilogram) shuttle. "That's a tough thing to answer," said pilot Jeff Moultrie, who will be in command when Endeavour performs an aerial tour over several California landmarks Friday. "What do you tell somebody? It's different. It's unique." For one thing, there's the noise. It is decibels louder inside the shuttle carrier aircraft compared with a commercial airliner because the interior is hollowed out to keep it as light as possible. Aside from a few seats, there are no galleys, overhead bins or even air conditioning. In case pilots forget they're carrying precious national cargo, the constant vibrations from above jolt them back to reality. Pilots have to be more careful when they make turns, but otherwise, the 747 handles like a regular plane. They also have to be hyper-vigilant about the weather because moisture can damage the shuttle's delicate tiles. Built for American Airlines, NASA acquired the aircraft in 1974 and used it for test flights from Edwards Air Force Base in California's Mojave Desert and ferry flights to the Kennedy Space Center in Florida. It obtained a second one in 1990, but it was retired earlier this year. The four current NASA pilots who can operate the modified 747 are ex-military aviators who split their time flying other planes including zero-gravity aircraft and T-38 supersonic jets. Even when the shuttles flew routinely, a cross-country lift wasn't always needed. To keep their skills polished, they flew practice flights every several weeks and trained in a simulator twice a year. Moultrie, who served as a commercial pilot for a decade, said he looked forward most to soaring in close to the Hollywood Sign. Even Angelenos have to keep their distance from the famed sign, which is surrounded by a fence. "It's bittersweet," he said of the final mission. "We definitely feel privileged to be a small part of history. But on the flip side, we're sad."